Last year Paul and I went to Harriman State Park in New York state on the weekend after Christmas in search of a winter hike. This year we decided a 2nd annual WWTS Winter Hang was in order so we returned to Harriman, only this time visiting the northern end of the park. 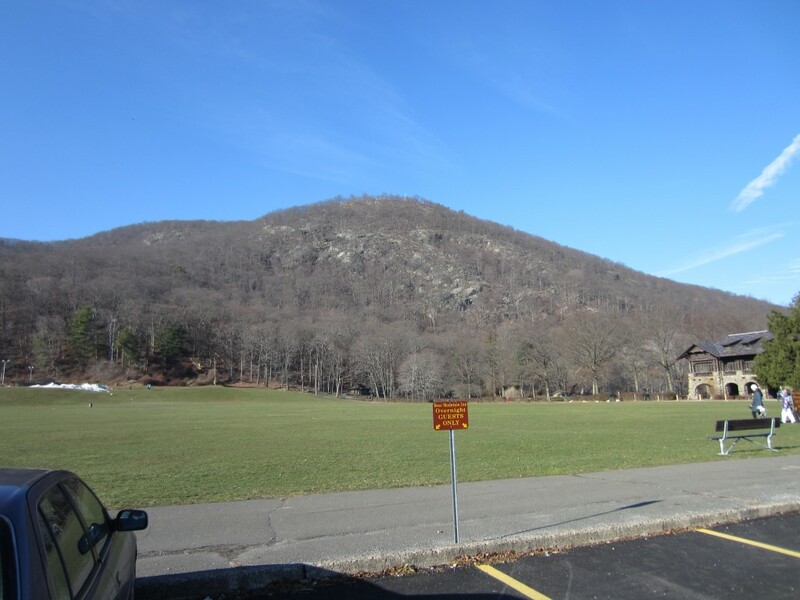 Bear Mountain loomed over the parking lot of the Bear Mountain Inn, and as we prepared our gear I thought, “Man, that looks like a rugged climb!”. It turns out I was wrong. 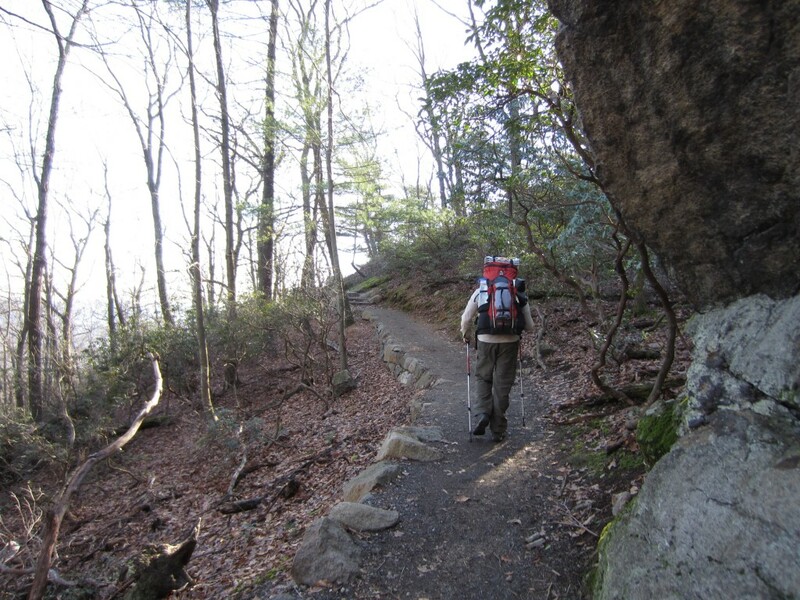 We would be starting out southbound on the Appalachian Trail, and when a trail sees as much use as this section does trail maintainers have to take serious steps to minimize erosion. 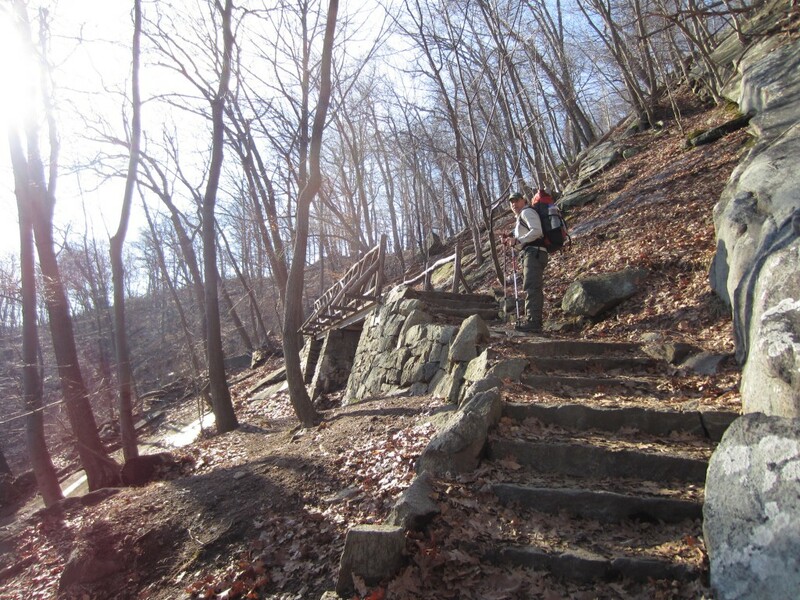 About half of the climb is on stone steps that climb just steep enough to let you know that you’re going to breath a little harder before you reach the top. 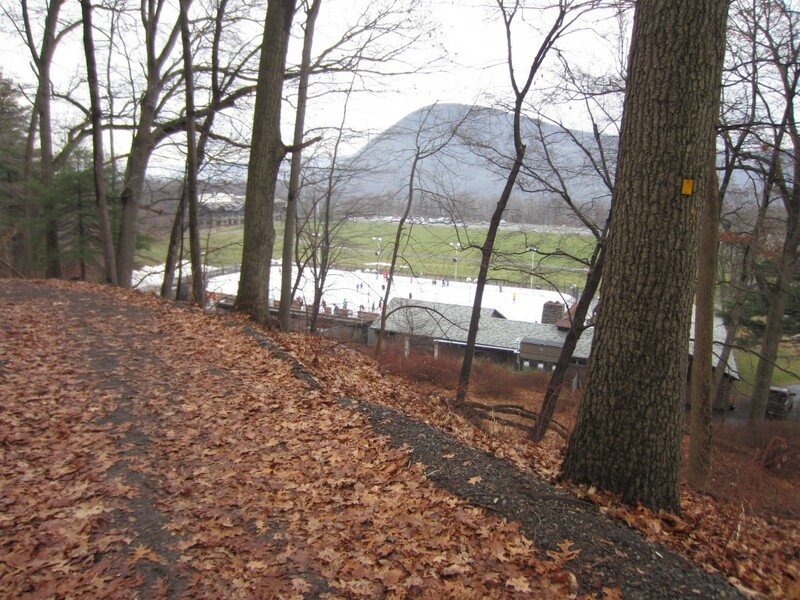 Not to worry, the grade relents and becomes more of a foot path, with nice views of the Bear Mountain Bridge and the Hudson River. We paused long enough to take it all in, and with a little coaxing Paul convinced me that lunch on the summit would be so much better, although that might be hard to imagine. 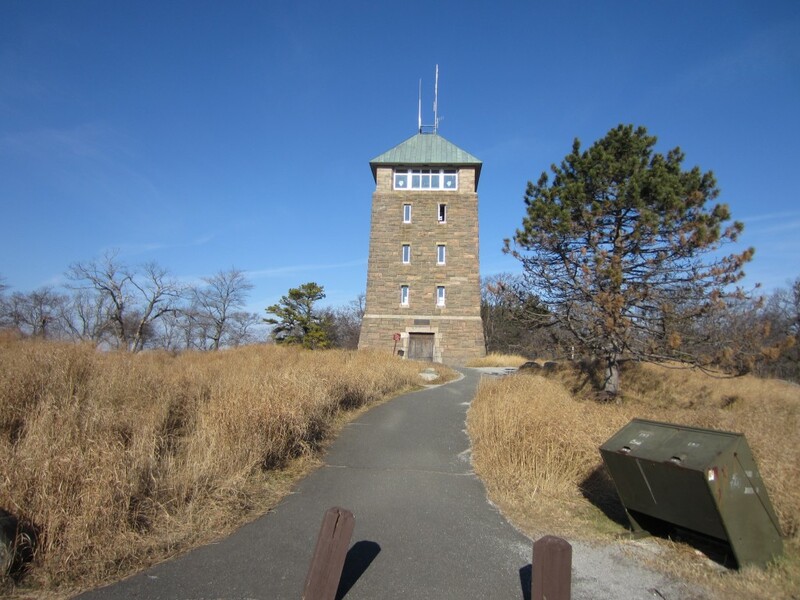 We passed through a nice little stand of pines and then the trail turns onto the paved road that goes to the tower on the summit of Bear Mountain. After a short road walk, and another short pitch with some nice views, we stood at the top, looking over the southern half of the park. There was a parking lot and folks sitting on benches, and even one of those doodads that you put a quarter in and look out over the views. Paul and I decided to pull up a comfortable rock and enjoy the scenery while chowing down. It was a nice, clear, comfortable day, with a light breeze, and by the time we finished lunch we had cooled enough that we knew it was time to get moving again. Instead of taking the bypass trail to avoid the hike on the summit we stayed on the AT, and I’m sure next time I’ll take the bypass. Not a whole lot to see, but I had to hike it once. The trail down off the mountain top was just as nice as the trail up, and soon we were in the valley again. After crossing Seven Lakes Drive we got to talking about life and some of the things that good friends talk about, and I didn’t notice that were missed a turn on the AT. 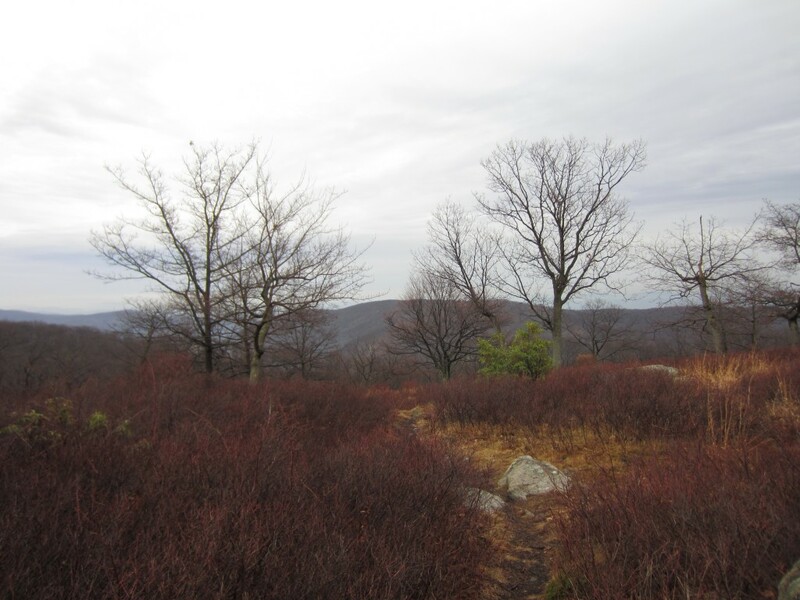 We walked along the 1777 trail, and then the Timp-Torne Trail, and finally we turned onto the Fawn Trail. About 100 yards onto the Fawn Trail I notice the white blaze with the red “F” and thought,” hmm, this doesn’t seem right”. A family was walking up from the Anthony Wayne Recreation Area parking lot and they confirmed my suspicion, I WAS in fact meandering without a clue of where I was. Well, to be fair, I had a clue, but I was meandering. Anyway, I also knew that we wanted to be on the Timp-Torne Trail, so after a short bit of backtracking we turned onto the blue blazed T-T trail. Up, up, up we climbed, over slabs and along some nice trail. 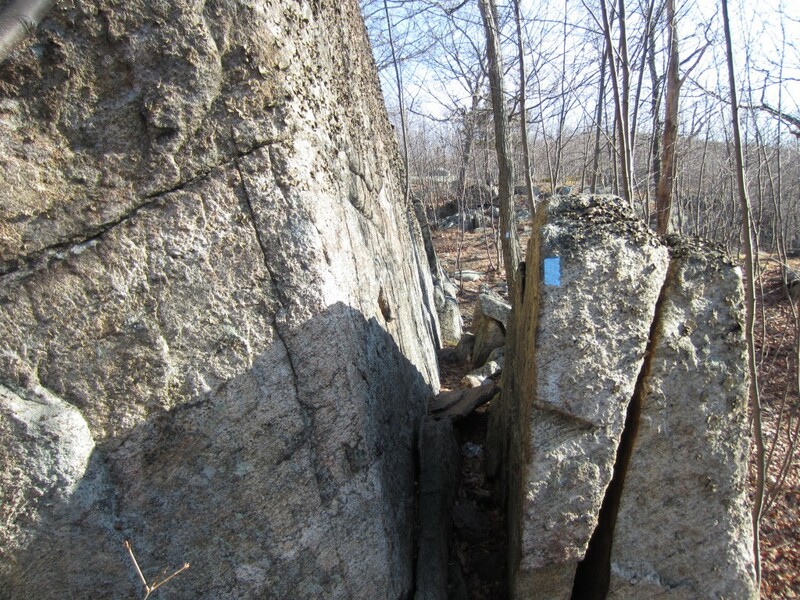 Once again cluelessness set in as I commented to Paul that I guess we were on the section that paralleled the AT, but where were the white blazes? I swear to you folks, I’m a much more competent operator than this, or I’d at least like to think so. 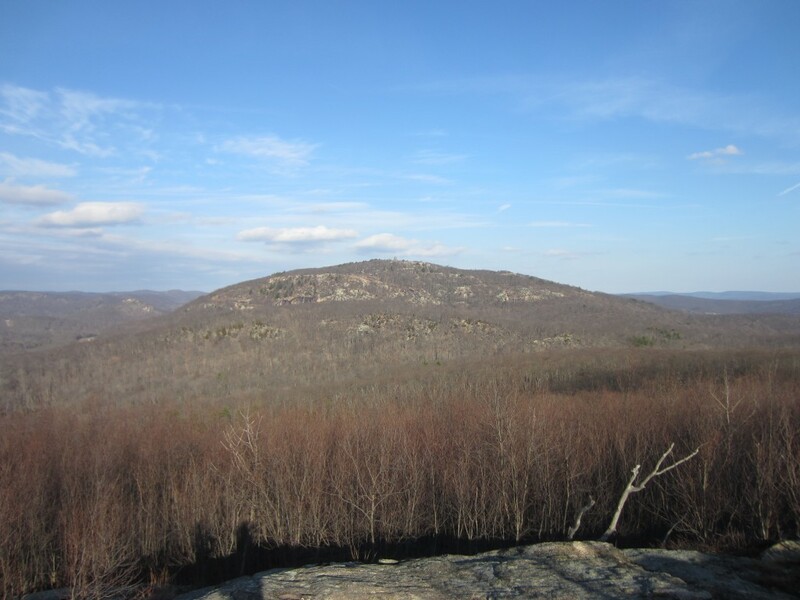 It turns out that we never doubled back to the AT, but got right on the blue blaze, but I guess I knew that at the time. I tell ya, it’s a wonder my brain doesn’t melt down sometimes immediately upon awaking in the morning. 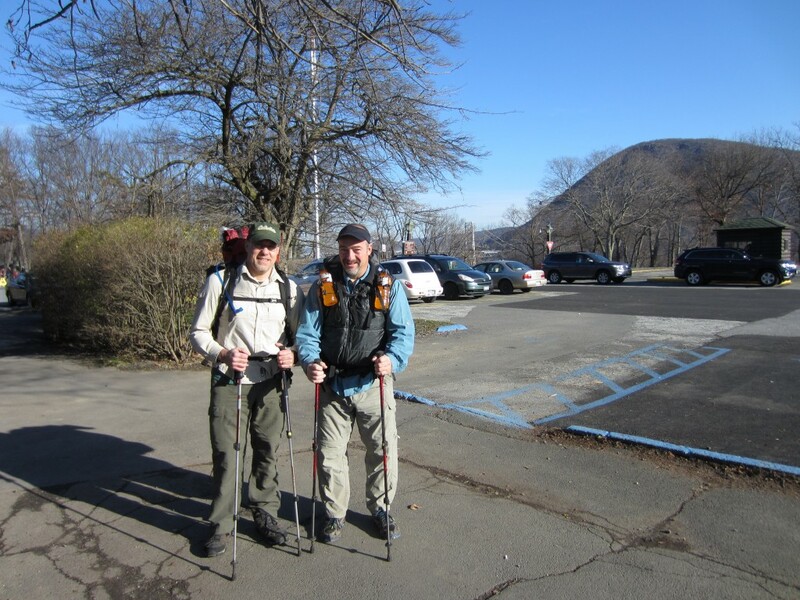 Oh well, no harm, no foul as we eventually linked up with the Appalachian Trail once again. What’s an adventure if everything goes as planned, eh? Soon enough we were walking up on our destination for the day – West Mountain Shelter. 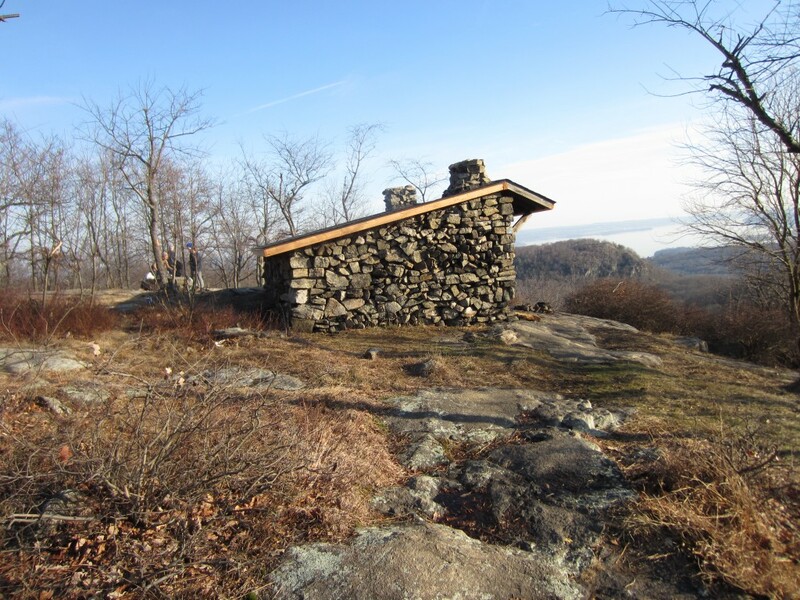 West Mountain Shelter has a bit of a bad reputation due to it’s easy access and lack of water, but the view from the front is amazing, with the New York City skyline some 25 miles distant. On top of that, there had to be a hundred places to hang a hammock. 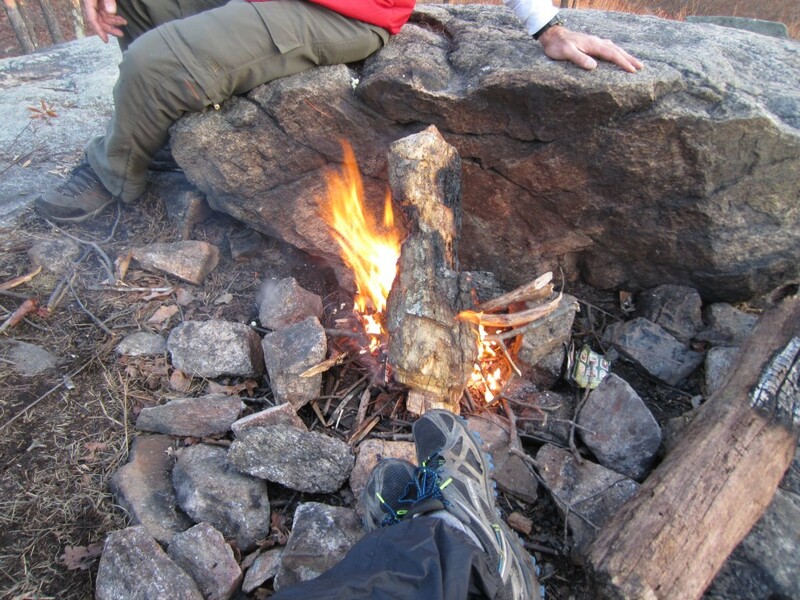 Paul and I immediately set about making camp and securing firewood, and although the wood was slim pickings we did find enough to get a small fire going. As I inhaled my dinner (Packit Gourmet State Fair Chili, and mighty tasty I will add), something told me to turn around. It was one of those magical moments in the outdoors that plays out over and over, even when no one is around to see it. The NYC skyline had suddenly become ablaze with the reflection of the fleeting sun, and in just a few short moments it was gone. 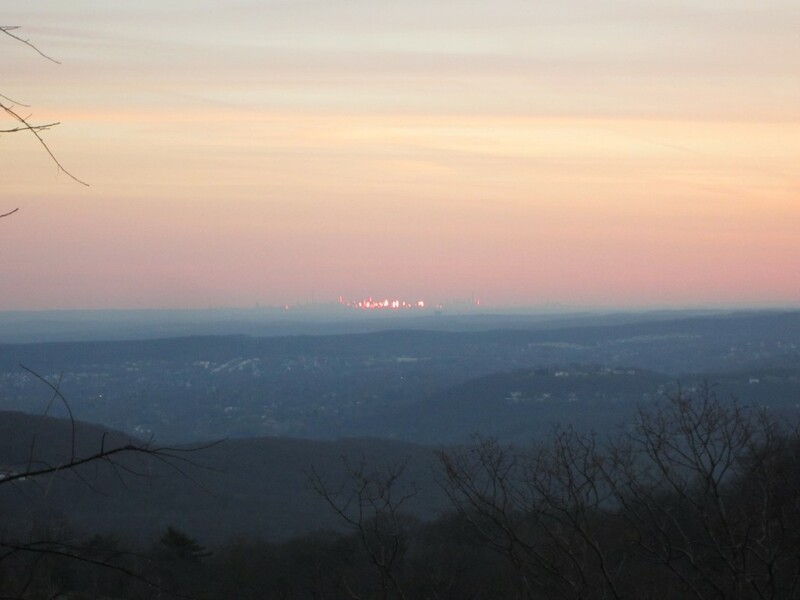 As the fire died we took in the views of civilization there below us, lights coming on one by one, and reflected on how fortunate we were to be here and now. 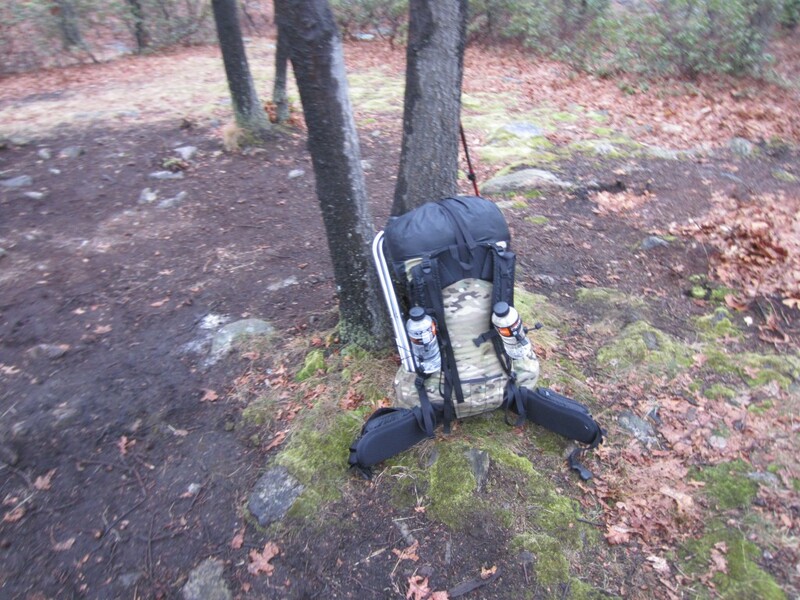 As always happens on winter hikes, we wind up in the rack early. 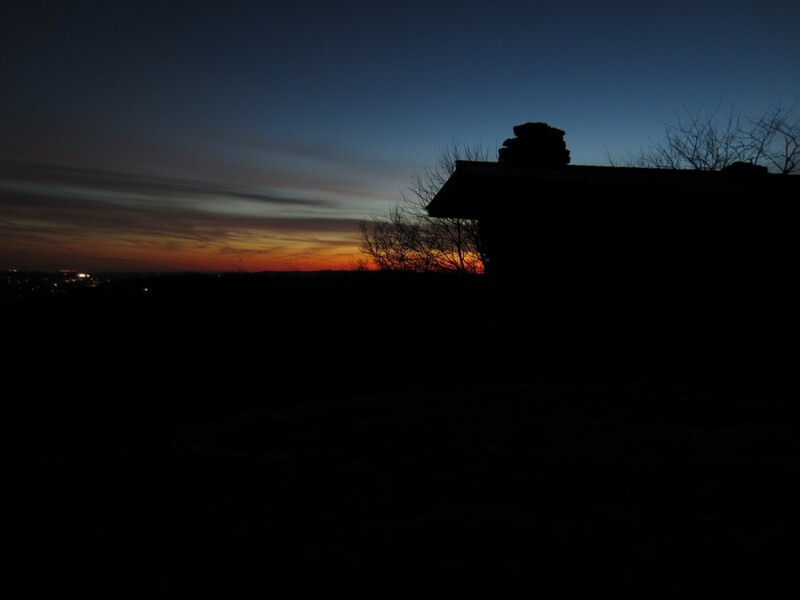 Winter nights in camp are long and it’s hard to sleep that long. 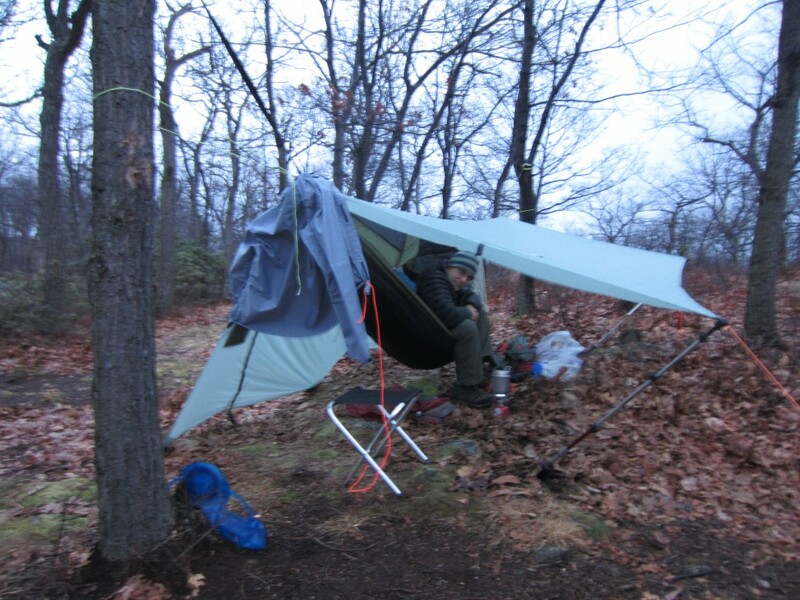 I was down and out somewhere around 6:30, but by 9 I had to get up to readjust my tarp. 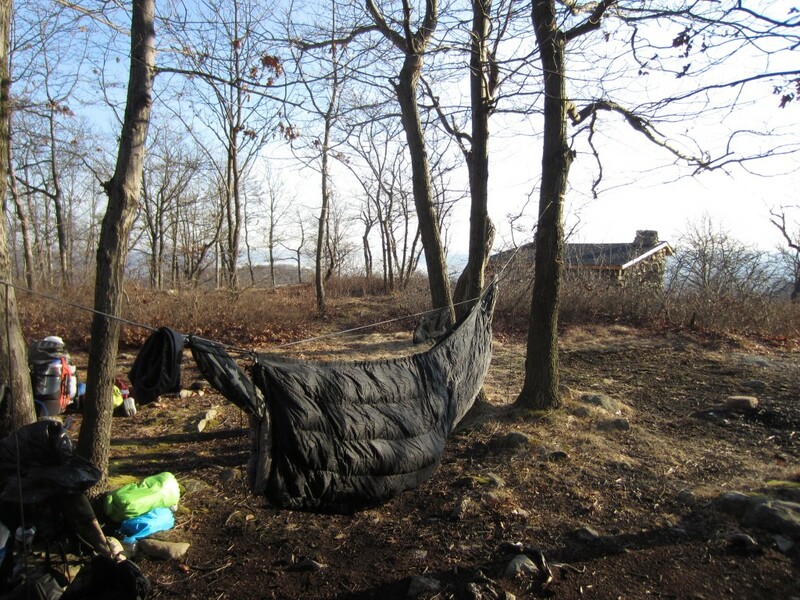 The wind had picked up substantially, and I couldn’t stand the flapping of my tarp any longer. By the time I got done resetting everything Paul was up as well, and we did the same with his rig. We went over to the shelter and took some more night shots before resettling in, and I only woke a few times during the night. Somewhere around 6 am it started to rain, and the pitter patter on my cuben tarp told me it was time to rise and shine. I made breakfast and a hot cuppa tea, and as my meal soaked I broke down my hammock. I had brought along a camp stool I got from Jacks R Better(the same one Shug uses), and it was well worth the weight when you look at the comfort it provides. It’s funny how as the years go by I fuss over the weight of some things, and then add weight back in other places. It was nice to sit under the tarp and pack in comfort. After packing and preparing for our walk out in the rain, Paul told me he had been thinking about our conversations of the prior day, and it led him to the days’ devotion in 2 Timothy 2:15, “Be diligent to present yourself approved to God, a worker who does not need to be ashamed, rightly dividing the word of truth.” As the priest of our home we will one day give an account to God as to how we conducted ourselves in that mission field. Did we lead with the kingdom in mind, or did we compromise with the world? Put on the whole armor and be not ashamed of the gospel. 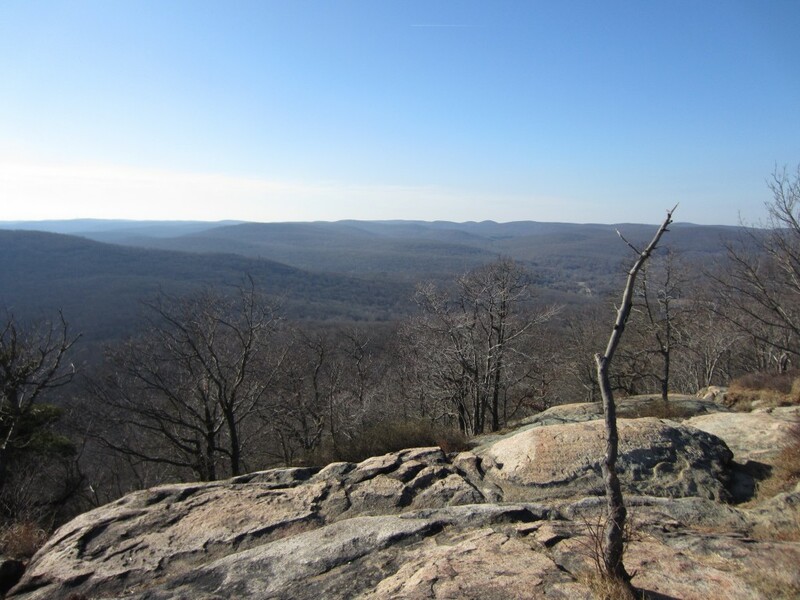 Our walk out this morning would be on the Suffern-Bear Mountain Trail, and I was anxious to see the northern end, as I hope to hike the length of the park on this trail in the spring. 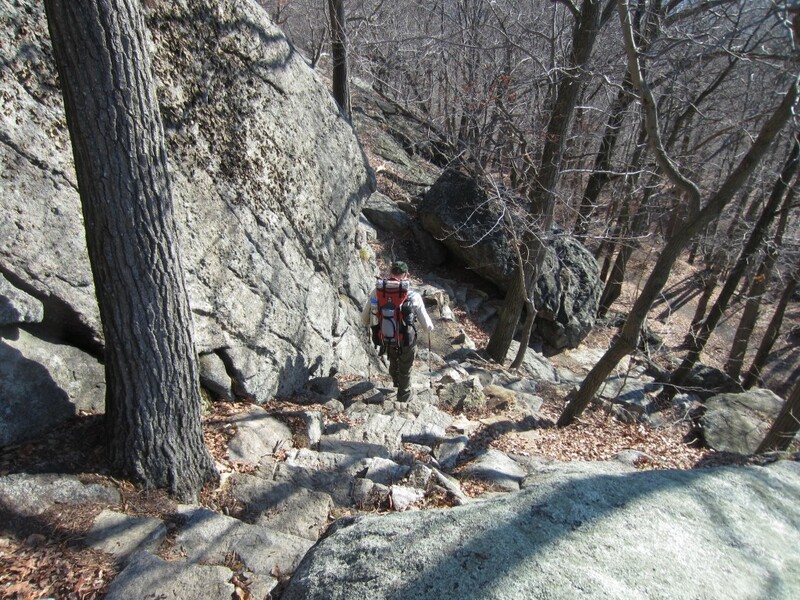 The trail started with a few ups and downs and water was plentiful. Eventually the downhill got serious and very rocky. 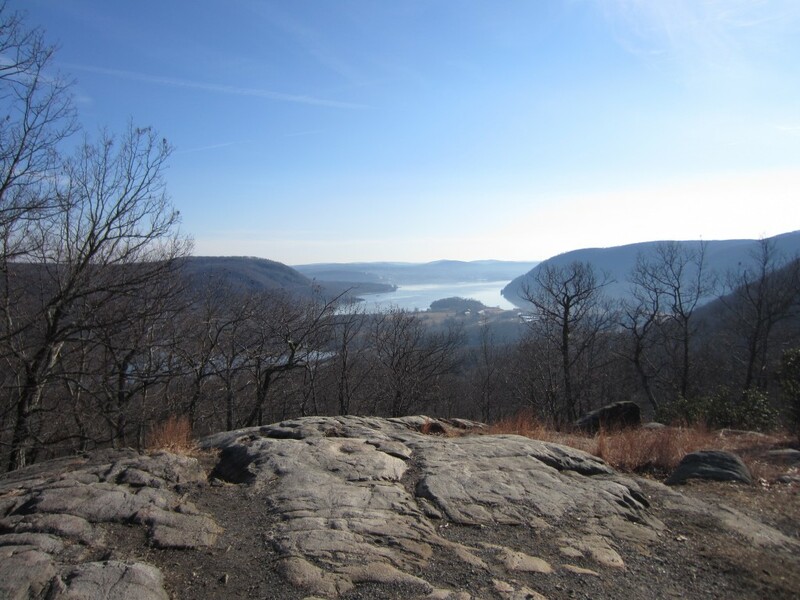 There were fleeting views of the Hudson, and then the trail turned into an old road as we reached Doodletown. Doodletown was a hamlet that had been inhabited at least since 1762, and at it’s peak 300 people had lived there. 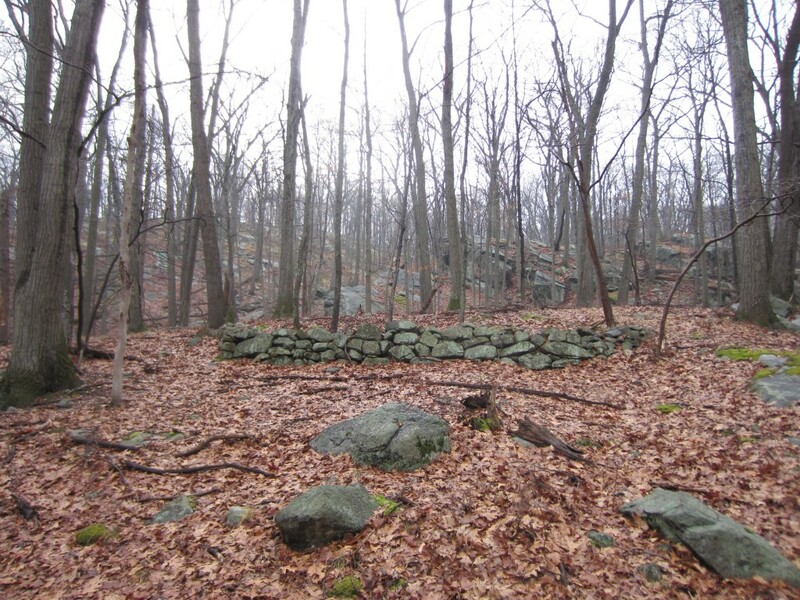 The park eventually bought out the residents, and by 1965 the town was completely abandoned. 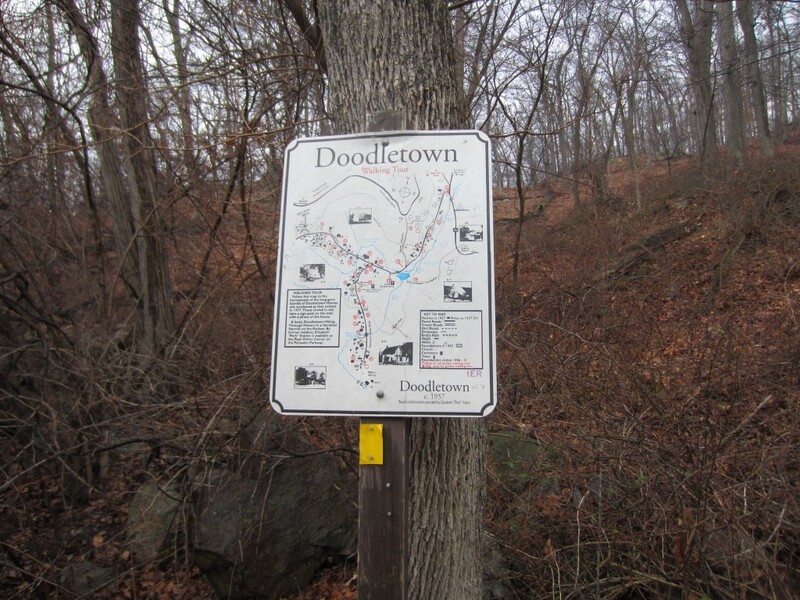 As you walk along the trail/road, you can’t help but imagine how rugged life in Doodletown must have been. These were some hardy folks. The miles flew by, and as we drew nearer to the trail head civilization became more apparent. First we passed some highway construction equipment and powerlines, then on the final downhill stretch we could hear music. It was the sound of the outdoor ice skating rink at the trail head. And just like that, bam, we were back. It was interesting to me how close, yet how far we were from people and niceties like ice rinks, and inns, and merry go rounds. It just goes to show you don’t need to go very far to get away. Just far enough. I can’t wait until next years winter hang!